I believe there is great value in cultivating original work and creativity in every individual. Making is an act of empowerment that can be a very gratify experience for everyone involved. All of my workshops are designed to work with a variety of skill levels within the same class. While each of my workshops cover color, pattern, and repetition which are core components of my work, the focus—indicated in the title of class—allows us to zoom in on a particular aspect of quilt design. Subject matter includes, but is not necessarily limited to the following–exploring color theory, composing abstract design, improvisation-ally cutting and piecing fabric, working with prints, and trouble shooting patchwork construction issues. I would love to teach for your shop, guild, group, or festival. 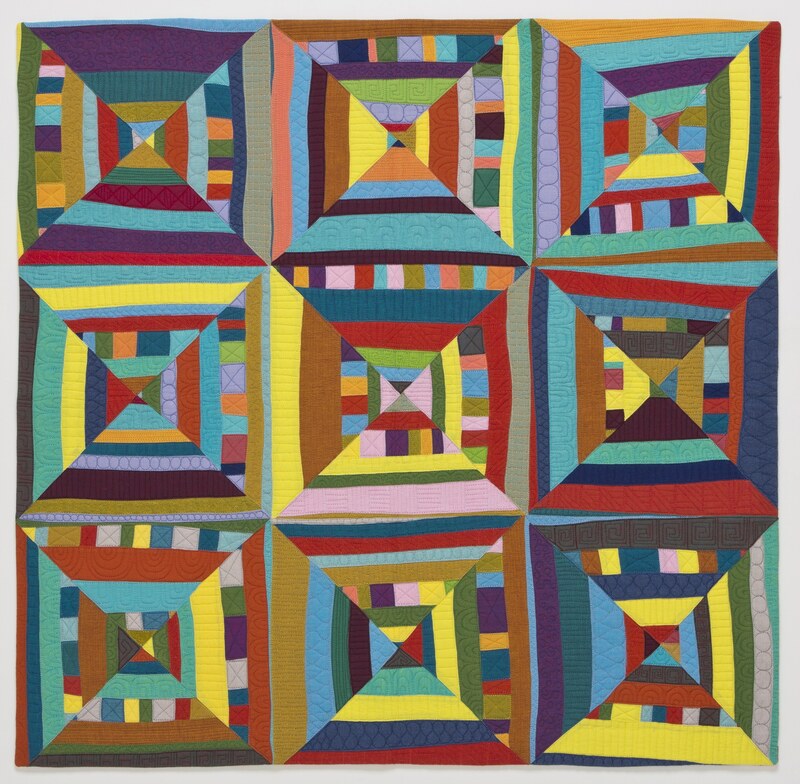 Using solid colored quilters cottons, students will learn how to stitch an assortment of pieced prints including stripes, tracks, dots, and grids. While learning these new techniques students will also be given information about selecting a color palette, improvisational piecing techniques, and ideas for taking these techniques and creating original quilts. A complete discussion of all the ways you can improvisation-ally PIECE a circle and/or curve in fabric will be covered in this class. 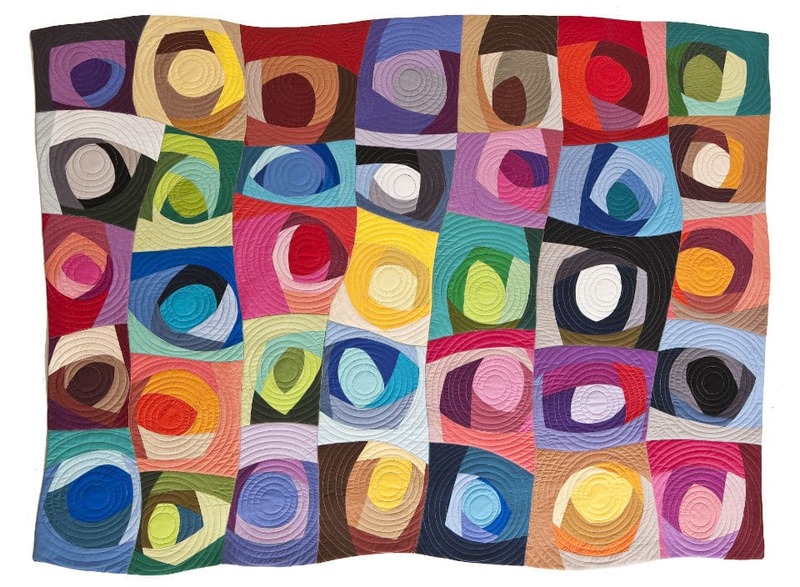 Students will leave with a collection of circle and curve quilt blocks–great for a sampler. 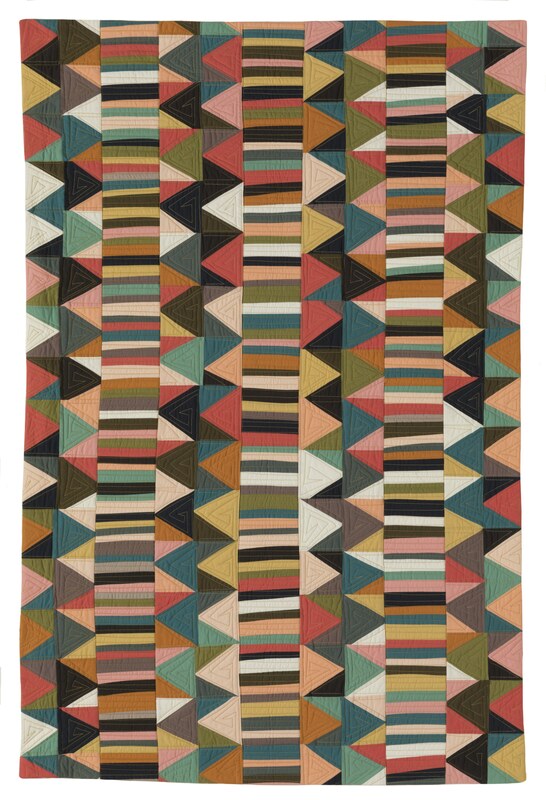 The triangle is an elegant shape that can be used to create dynamic quilts. This workshop covers all manner of triangles and way to improvisation-ally cut and piece them into patchwork art. 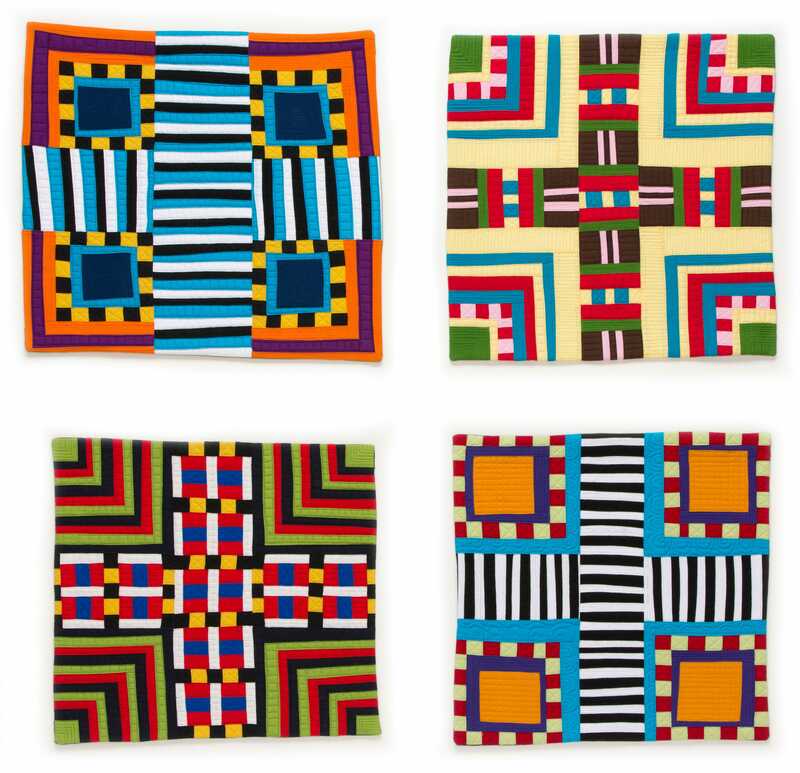 Students will use the traditional log cabin quilt block as well as other linear quilt block shapes as the starting point for creative and original compositions. 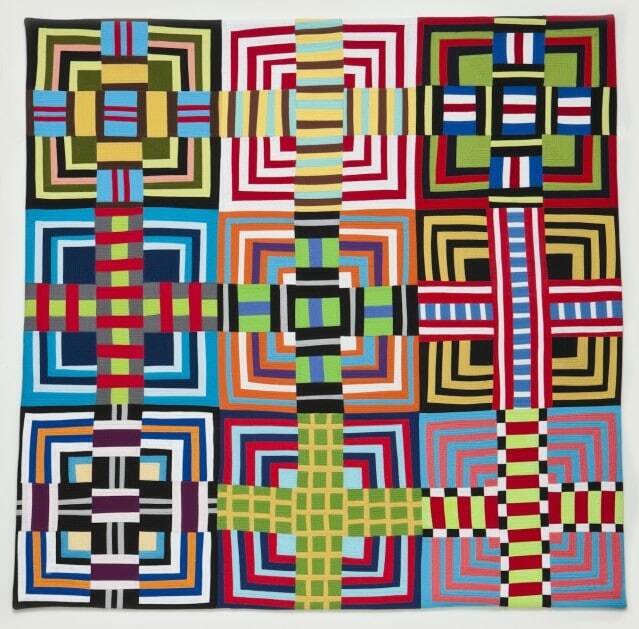 Improvisational piecing, contemporary quilt design, and using lines to make shapes are all discussed in this class. This is a workshop for scrap-a-holics. 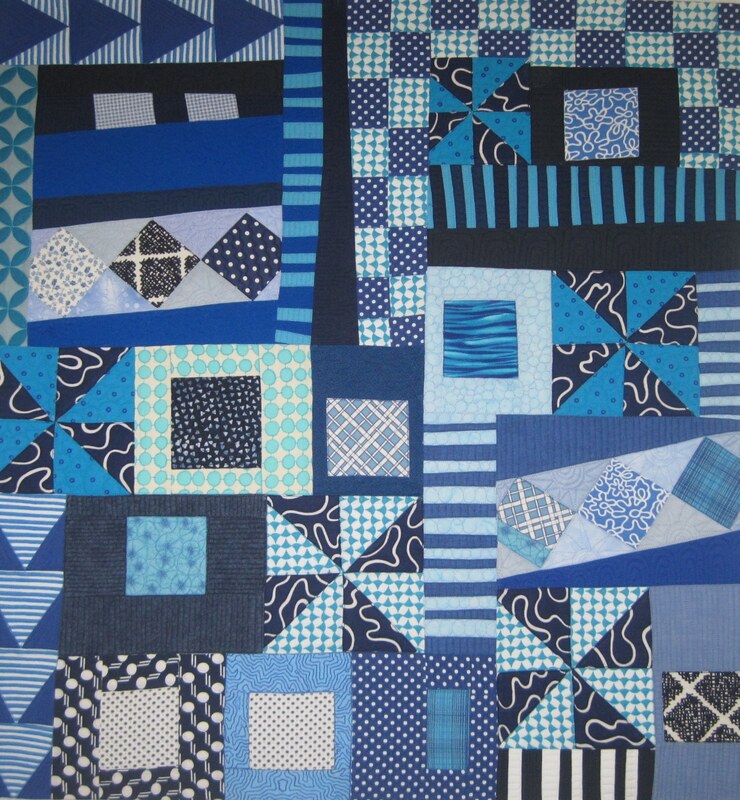 Learn how to shape, sort, and piece your fabric bits into art quilt masterpieces. 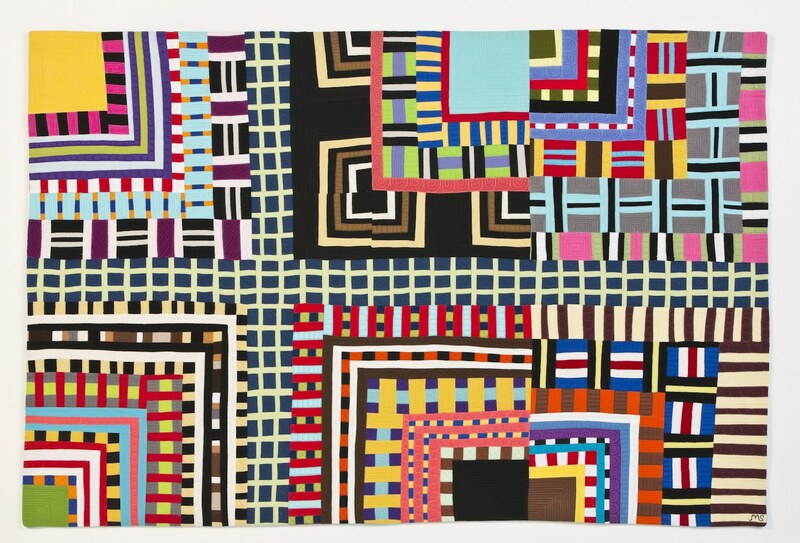 While learning how to work with bits and pieces, students will also be given information about selecting a color palette, improvisational piecing techniques, and ideas for taking these techniques and creating original quilts. Using the traditional quilt block as a foundation for our art, we will explore new territory in making contemporary quilts. We will take simple traditional quilt blocks and blow them up, repeat them, distort them, and in the end create fabulous new compositions. Using the traditional quilt block or other set of compositional lines (bridge, building, etc…) as your starting point we will enlarge and magnify the lines of the structure and use them as our skeleton for building a pieced composition. From there we will explore a variety of ways to create texture, pattern, and repetition in that space. All leftover fabric, UFO’S, orphan blocks, and random strips of fabric are welcome in this class. We’ll take those pieces of what not and make them into a fun improvisational masterpieces. The focus of this workshop is on bit making (creating small improvisation-ally cut and pieced traditional quilt blocks) and composition. Working from a personal source of inspiration found in nature or place, students will learn the basics of creating improvisation-ally pieced abstract work. Students will learn about palette building (color theory) as well as how to create abstract pieced images. This workshop empowers students to take the basic shapes of patchwork to a new level. We will start by learning how to create improvisation-ally cut and pieced stripes. These “stripes” made into traditional patchwork shapes will be the basis for creating dynamic patchwork. 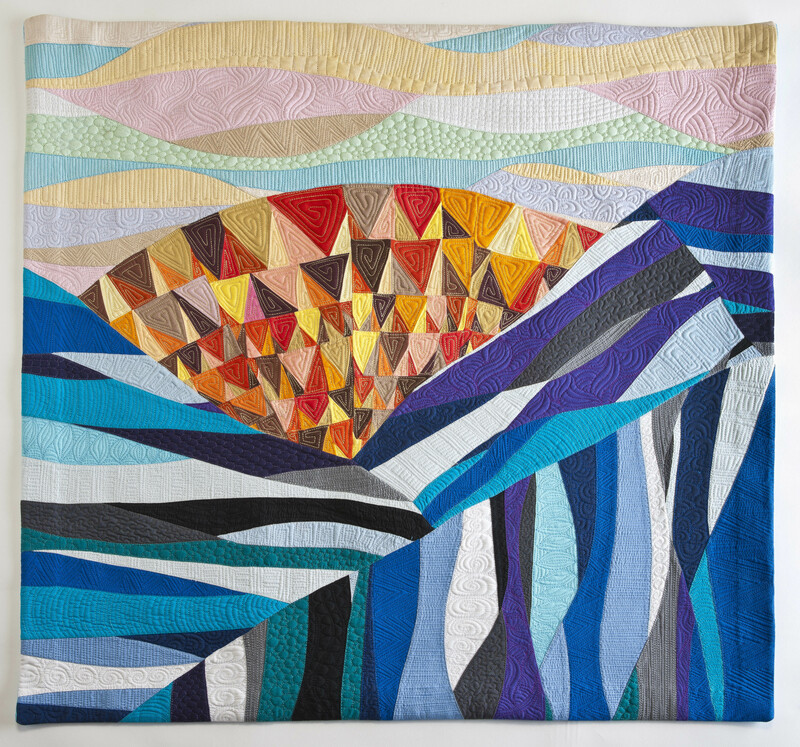 Quilt Artist Maria Shell will share her work from her first stitches to her most recent pieces along with some fun stories about trying to quilt while raising three boys in the wild lands of Alaska. 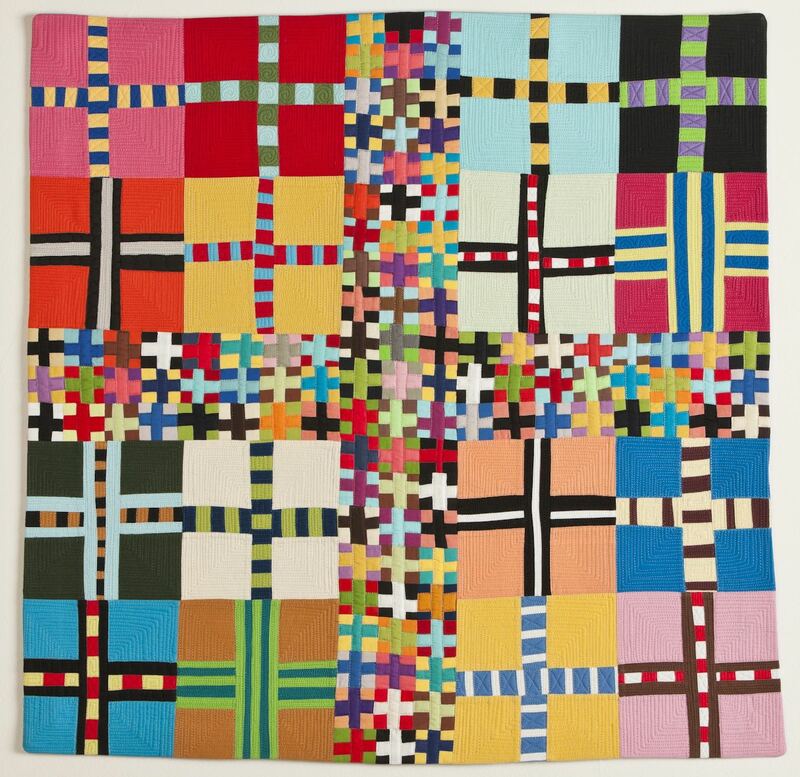 Maria’s work is grounded in the the tradition of American patchwork while also connecting to both the modern and art quilt moments. It is journey filled with laughter, dark Alaskan nights, and lots of stitching. In 2014, Maria Shell spent two months as an artist-in-residence at the McColl Center for Art + Innovation in Charlotte, North Carolina. While there, she worked weekly with a formerly chronically homeless community now living in Moore Place. 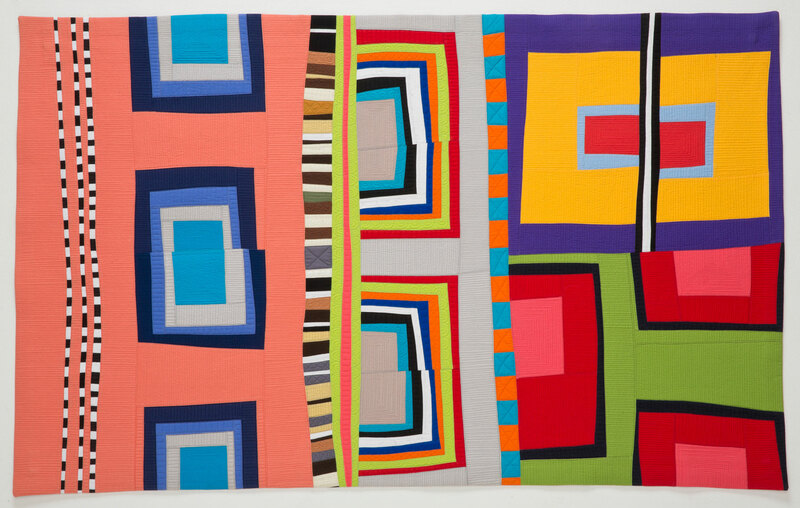 By teaching basic sewing skills to the residents, she developed a relationship with the residents of Moore Place that eventually lead to the making of a community quilt that celebrated the residents and their journey towards finding a home and a community. Share her wonderful story. 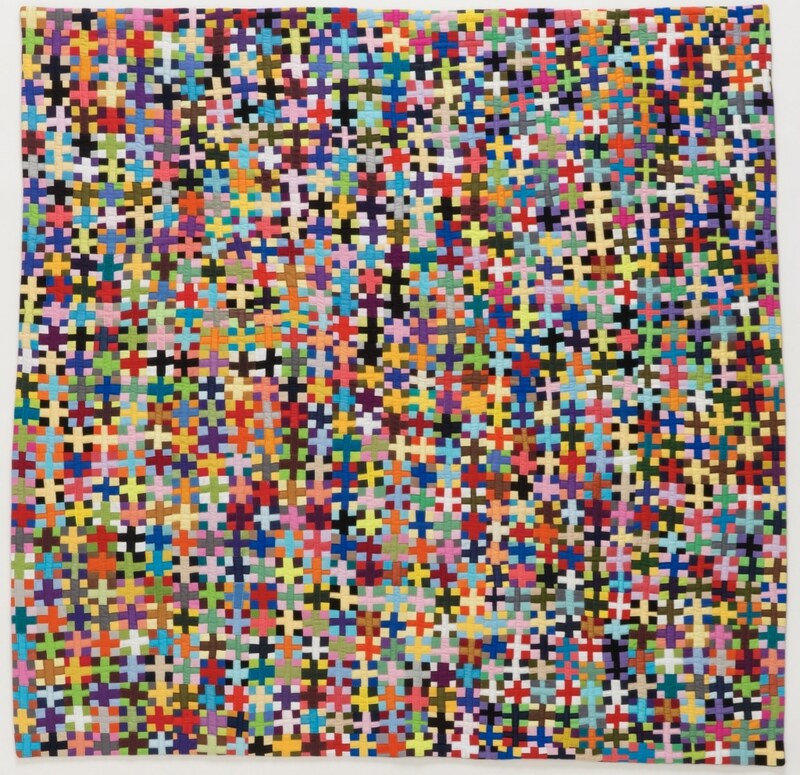 Maria Shell started out as a traditional quilter, but soon found herself making abstract pieced art quilts that look surprisingly modern. Maria will share her personal journey in and about the traditional, art, and modern quilt movements. Can you be all three? Come to the lecture and find out. In the fall of 2016, Maria Shell was invited to judge, teach, and exhibit her work at the China International Patchwork Festival & Tournament in Beijing, China. The festival is intended to cultivate a Chinese Patchwork tradition through exhibiting their work, seeing international artist’s work, and taking classes with those artists. This lecture shares that experience with QuiltCon 2018 attendees. How do you get from nervous & shy stitcher to exhibiting and talking your work internationally? This lecture details the steps you can take to get out from behind your sewing machine and into the larger world of being a professional quilt maker. I love to teach! Please contact me here to schedule a workshop or lecture or ask any questions. Thank you!